BEIRUT Intense clashes between the Syrian army and rebel fighters near the country's second-largest airport killed around 150 people in recent days, anti-regime activists said Friday, pointing to the significance both sides in the country's civil war place on controlling key infrastructure. The battle for the international airport near Aleppo, Syria's largest city, resembles other battles over strategic assets that could provide an edge in the larger fight for the country. This week, rebels seized a hydroelectric dam and a major oil field, cutting off President Bashar Assad's regime from key resources necessary for its long term survival. On Friday, activists also reported that rebels seized an air defense base and fought near two other army installations in Syria's north. Rebels have been trying for months to capture Aleppo's international airport, which lies east of the city in a complex with a smaller military airfield and an army base charged with protecting the area. The base, home to the Syrian army's 80th Brigade, fell to rebel forces on Wednesday, and fighting has continued over the airports since, with both sides shelling each other's positions. The Britain-based Syrian Observatory for Human Rights said Friday that some 150 people had been killed in the fighting over the last two days, roughly half of them rebels and half of them government troops. "The operation will continue until we control the airport and Nairab," Col. Abdul-Jabbar al-Aqidi, commander of the rebels' Military Council in Aleppo, told pan-Arab Al-Arabiya TV. If the rebels were to capture the two airports, it would be a symbolic blow to the regime and could shift the strategic balance in northern Syria. 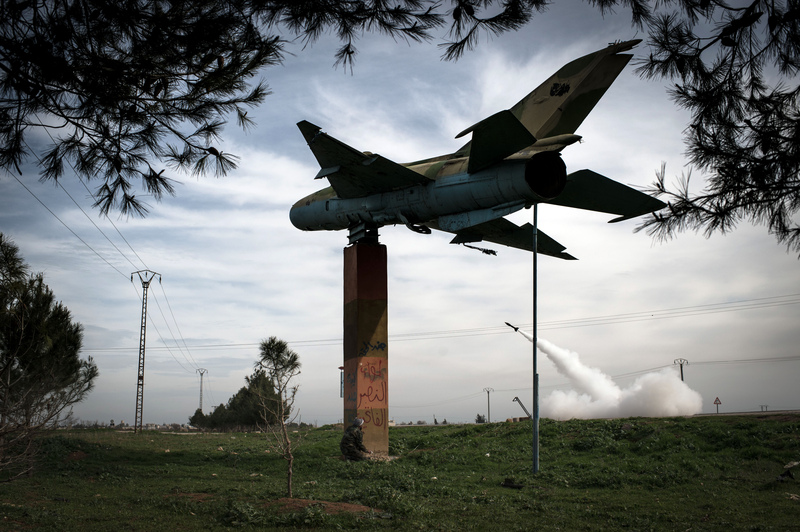 The regime has used the airports to ferry supplies to its forces bogged down in the stalemated fight for Aleppo, though recent clashes near the airport have halted air traffic. Rebel leaders hope their forces will someday use the airports to fly in aid and other supplies - a scenario that for the moment appears unlikely. The rebels have captured military airports before but have never managed to use captured aircraft. And the airport would remain vulnerable to attack by Assad's air force, which regularly bombs areas after the rebels take them. Elsewhere, the Observatory reported on Friday that rebels has seized an air defense base in the village of Hasil, southeast of Aleppo, and were clashing with the army at the nearby Kuwiras air base and around the Wadi al-Deif army base in Idlib province. The relentless violence has led to deteriorating humanitarian conditions for millions of Syrians. In Geneva, the U.N. World Food program said some 40,000 Syrians have fled the northeastern town of Shadadah. Rebels seized the town and most of a nearby oil filed in days of clashes this week. Most of those who have fled went to the provincial capital of Hassakeh province, which produces most of Syria's oil. The United Nations says nearly 70,000 people have been killed since Syria's crisis started in March, 2011. Syria's conflict has posed a dilemma for the international community. While the U.S. and many Arab and European countries have called on Assad to leave power, Russia, China and Iran continue to back the regime. Russia, which has been Syria's primary arms provider for decades, has said it will continue to fulfill its arms contracts. On Friday, the Customs Investigation Service in Finland said it had intercepted a shipment of spare parts for tanks en route to Syria from Russia. The service's head, Petri Lounatmaa, said officers confiscated a shipping container on Jan. 8 because it did not have a transit license and contained 9.6 tons of tank parts. The service suspects the shipment violated a European Union ban on weapons exports to Syria and is investigating with other international authorities. International diplomacy has failed to stop the violence and calls for the sides to negotiate a political solution have gone nowhere. The opposition's main umbrella group, the Syrian National Coalition, said in a statement Friday it would not allow Assad or members of his security services to participate in talks to end the crisis. It did not rule out, however, dialogue with some members of his ruling Baath party, welcoming talks with "honorable people" from all parts of society who "have not been embroiled in the crimes against the Syrian people." Still, neither side has proposed a concrete plan for talks. In Turkey, Foreign Minister Ahmet Davutoglu proposed that the U.N. Security Council set up humanitarian zones that would be under joint government-opposition control to facilitate the delivery of aid to Syrian civilians. He did not elaborate on the proposal, which he mentioned in an address to Turkish and E.U. legislators, and criticized world powers for failing to agree on how to stop Syria's war. "If the U.N. Security Council won't act with the death toll in Syria reaching 70,000 and with millions being left hungry and begging for bread in winter conditions, then when will it act?" he asked.